There are so many great recipes for homemade salad dressing that I almost despise having to purchase it at the grocery store. If the ingredients are already in my refrigerator, spice rack, or herb garden, it is more economical to mix some up in the kitchen. The only part of making dressing that doesn't thrill me is pulling out my heavy blender, then trying to find a container to store the leftover dressing in, and finally, cleaning the blender. Then I found this wonderful little vinaigrette mixer which looked like it could solve those issues. The Herb n'Serve is basically a small battery operated mini-blender just for making salad dressing or marinades. 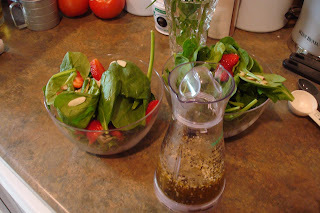 Not only is it a fast way to create a concoction, but here is what I really love- after blending your dressing, you simply remove the carafe from the blender and store the dressing in the container (which also has a lid.) This little blender also came with a booklet full of recipes for easy dressings and marinades. As someone who is generally not big on having a lot of kitchen gadgets (we don't have space to store them) I have to say this little device is really worth it. It is not as powerful as a blender, but has enough power to get the job done. It's also not as loud as a blender. The only con is that it does require an astounding quantity of 6 AA batteries to work, which came included in the box. But since it only takes ten seconds to mix up some dressing, I can't imagine they would need frequent replacement. Generally, it's a great little convenience. The fact that you can mix up the dressing and it can go from fridge to table is my favorite thing about it. *Disclaimer: Although I was given this item for free to review on my blog, I was not paid to do so and my opinions of the item are 100% my own. 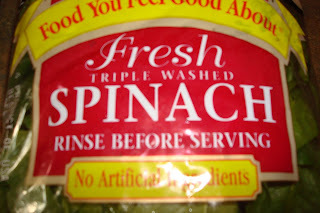 Do you notice anything funny about this bag of already triple-washed spinach? Well, I like the "no artificial ingredients" label. I would hope there is nothing artificial in there. But what really got me is the "Rinse before serving" instruction which would make this quadruple washed. 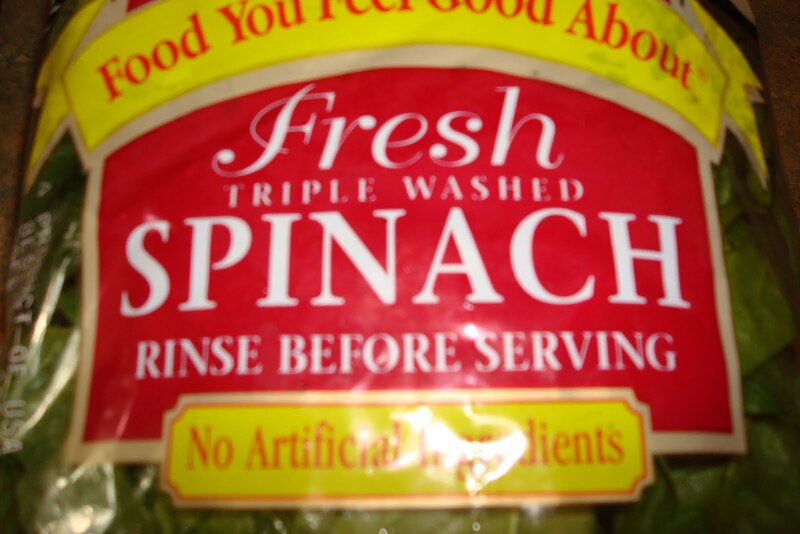 Just how dirty was this spinach? After pulling some weeds and twigs out of the bag, I'll tell you- they weren't kidding about rinsing! Blend all ingredients except cooking oil in blender. 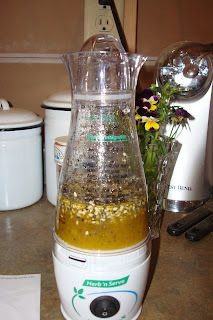 Then, add cooking oil, blend once more, and refrigerate until use. Makes a little over one cup of dressing. I concur. Homemade dressing is where it's at! This is a cute little gadget! I'm sending you a photo of my lower-tech gadget I often use for homemade dressings. By the way, I've stolen your recipe for my files. Thanks! It looks very tasty and unique! I love the moderately clean spinach photo! Classic! 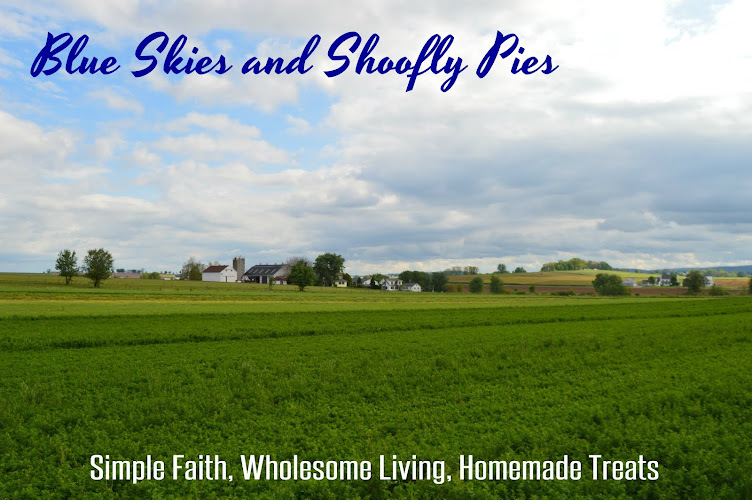 Mmmmmm, that recipe sounds tasty! I will have to try that. I love the nifty dressing blender! I've never seen anything like it but it looks like something I'd use frequently this time of year when we have lettuce taking over the garden!